I am so excited to have Trevor, one of the seriously hot and melty boys from Kasie West's 2013 debut Pivot Point here today to answer some questions, and give away an ARC of this book! I loved this one, and totally devoured it as fast as possible, and couldn't stop thinking about it for days. Trust me when I say you want this one! So let's meet Trevor and get on with it! Um... my mom says I'm too laid-back. I think that's her nice way of saying I'm always late. So two more? Unorganized. Private. When Addison told you about her ability, what was going through your head? At first I thought she was trying to be funny. But then I thought, impossible. It didn't make sense. I like things to make sense. Everything about her from the way she smiles to how she bites her lower lip when she's nervous always made sense to me. So I was trying to put together what I knew about her with what she was saying. It just took a minute. If you hadn't of been injured, and quit football, do you think you would've noticed Addison when she showed up at your school? Absolutely. I'd notice her anywhere. What about football do you miss the most? The team. Being part of something where everyone is working toward a goal. We won together. We lost together. You can't be part of that from the outside. What's your favorite part of Addison to draw? Her hair. She has great hair. What's it like to kiss Addison? I don't kiss and tell. Wait, does she? Has she been talking about us kissing? What did she say? This interview is getting a bit personal......boxers. Sea creature? Where's Addison? She's the one who's good with metaphors or symbolism or whatever the deeper meaning of this question is. Thank you, Trevor, for stopping in! Seriously, guys, I love this boy. And he is so in my Boy Closet. But since I want everyone to read this book, here's your chance to win an ARC! This contest is US Only and ends November 9. No entries will be accepted through the comments, but you know you want to leave one regardless. 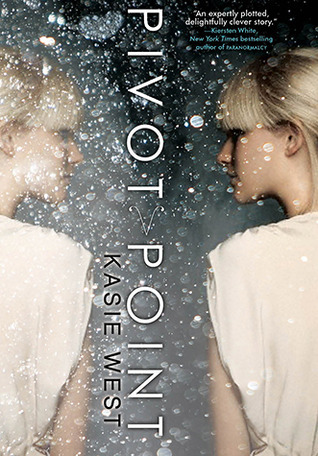 Pivot Point is one of the best books I've read and Trevor is definitely one of my favorite male leads. Thanks for the interview with him! Yes!! He is so a fave of mine too! And I adore this book, so glad you did too!! Awesome timing! I hope you win the ARC! I need some help with that sea creature question too...Is anyone here good with symbolism?